And the winner selected by popular vote? Frequent readers here know that my photos are an eclectic mix: some have more merit as Art – capital A – than others, some are quirky captures just for fun. Some are personal anecdotes of encounters, and some the field notes of a naturalist. One thing they all have in common, though, is the birds are all wild creatures observed in nature along the waterways of Eastern Massachusetts. The photo at the top of today’s post had the greatest percentage of votes, and as you can see from the results below, second place had a three-way tie, and there was a five-way tie for third. Thankfully there were no calls for a recount of any votes and voting wasn’t plagued by any hanging chads. A big THANK YOU to all who voted. Thanks to Ben H and WordPress for the recent WPC challenge: 2017 Favorites. Ben asked us to share our favorite photos posted in 2017. Please click here to see the photos I selected from this blog. From July 1 through July 30, 2016, I was the Featured Artist of the Month at the Summer Street Gallery. The Great Blue Heron photographs once again graced the walls of the lobby and theater for my third one-woman show at The Center for Arts in Natick. In addition to the visual arts shown at the gallery, TCAN has a lively, dynamic lineup of upcoming performing artists. Through July 13, 2017 I was a Featured Artist at the Five Crows Gallery in Natick, MA. Drop in and see the work of the many wonderfully creative artists who show there when you’re in the area. Frequent visitors to this blog will have little doubt that the Great Blue Heron is my muse. Perhaps she is also yours? This week’s WordPress challenge has asked about our favorite photos posted in 2017. As an artist, I’m more interested in YOUR favorites – enough about me! Whether or not the Great Blue Heron is your own muse (or totem, or spirit animal, whatever) I would love to know which are your favorites. After the photos below, there’s a poll where you can let me know which you like. It has been 4 years since I’ve included a poll and so I hope you participate. Thanks to Ben H and WordPress for the recent WPC challenge: 2017 Favorites. Ben asked us to share our favorite photos posted in 2017. But enough about me! I am more interested in YOUR favorites. 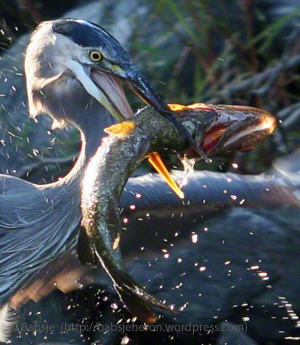 The threatening skies weren’t the only peril facing the great blue herons on the nesting island. Great blue heron guarding the nest while a red tailed hawk circles in the background. In heightened vigilance, one heron stood sentry above the nest while it’s mate stretched out low over their clutch of eggs. They had mated not quite four weeks earlier, and predators already had designs on the eggs and chicks. The top photo here shows a red tailed hawk circling menacingly. Less than 48 hours earlier when only one heron occupied the nest, a red tailed hawk landed on the treetops mere feet away from the nest. Great blue herons have little to fear from predators in a nest seventy feet up, except for eagles, great horned owls, and certain raptors. This red tailed hawk is one such predatory raptor. Red Tailed Hawk threatening nesting Great Blue Heron as smaller birds look on. The photo above shows the scene two days before, with the red tailed hawk lurking at the left of the frame. At right, the heron in the nest is on alert, cap feathers erect in alarm. Above the hawk, several smaller birds wheeled and spun and scolded the hawk in a cacophonous squabble that was audible in my hide all the way across the channel. My heart was in my throat as I watched the scene unfold. I have written before about the symbiotic relationship between cormorants and great blue herons, but on this day there were no cormorants about. Instead, jays and grackles came to the rescue. The standoff went on for quite a while, but when it was done, the jays and grackles had vanquished the red tailed hawk. If a hawk can be said to “slink off” in defeat, this one certainly did. As you can see from the photo below, not content with the hawk merely leaving the island, one of the smaller birds latched on to the hawk’s shoulder and pecked at the hawk’s head as they flew off together. One of the smaller birds rode on the hawk’s back, pecking at his head. Thanks to Ed Prescott for the Sunday Stills: Birdhouses prompt. Thanks again to the kind folks at NaBloPoMo for the National Blog Posting Month challenge this November.